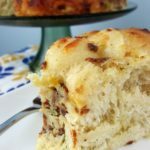 Planning a brunch? 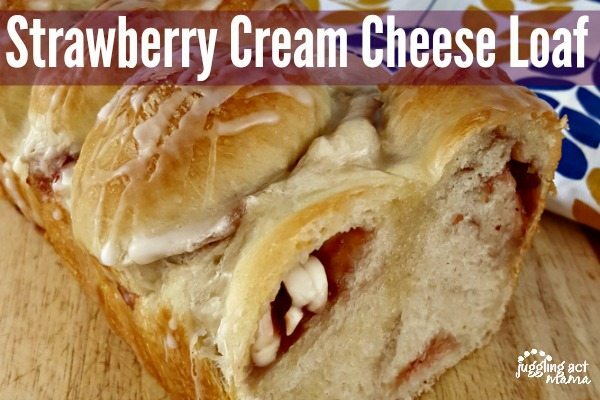 Add this Strawberry Cream Cheese Pull Apart Bread to your menu! 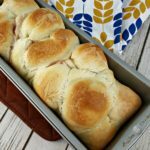 I love baking with the kids and this Strawberry Cream Cheese Pull Apart Bread is such a fun recipe to make with them. Making the dough pockets takes a little finesse, and is easier for adults, but kids can easily help spoon the jam into the rolls. And once the loaf is risen and baked, kids can help drizzle on the yummy icing, too. My kids favorite part though? Slicing the bread and finding out what cool pattern is inside. Where did all those little pockets end up? And who will get a piece with the most filing? It’s pure breakfast fun! If I was having to make this dough from scratch, it would take forever. Not only would the kids get bored, but so would I! 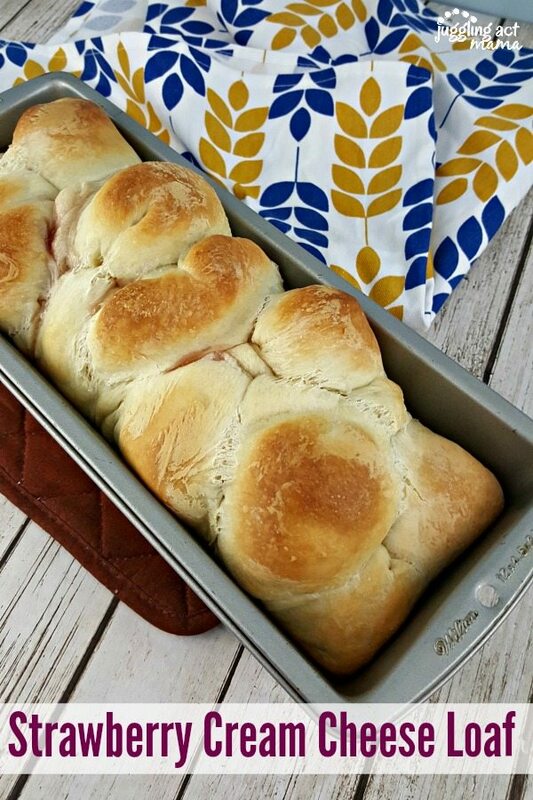 With this Strawberry Cream Cheese Loaf Pull Apart Bread, I start with Rhodes Dinner Rolls frozen dough. It’s as simple as thawing, filling and baking! There’s no kneading, no flour all over the floor, and very little clean up. That’s my kind of recipe! I love semi-homemade recipes because they leave me with time to do other things with my kiddos. You can use store-bought jam, and swap out the flavor for a variety of delicious flavors. To me strawberry and cream cheese just pair so well together, but raspberry preserves or blueberry jam would be delicious, also. If you’re looking for a great homemade strawberry jam recipe, check out my Strawberry Lime Jam this berry season. It’s so delicious! Take the thawed dough and flatten each ball into a 4-inch circle. Place a smear of cream cheese and about a half teaspoon of jam in the centers. Pinch the edges of the dough together to enclose the filling. Place the dough balls into a greased 10×5 or 9×5 pan. Cover with plastic wrap and let rise. Remove the wrap and bake at 350-degrees F for 30-40 minutes. 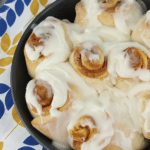 Spray a 10x5 or 9x5 loaf pan, set aside. 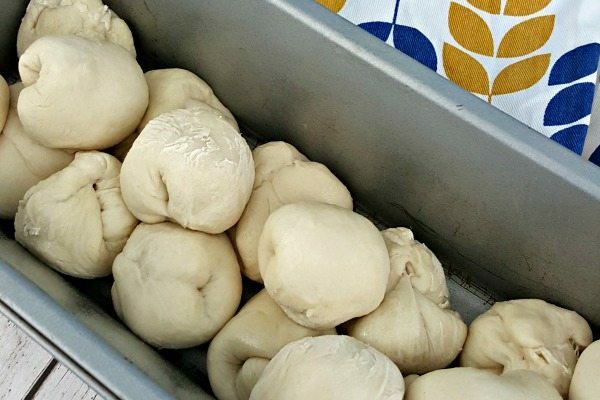 Flatten each dough ball into a 4-inch circle. Place a smear of cream cheese and about a half a teaspoon strawberry jam in the centers. Pinch edges of dough together to enclose filling. Place the dough balls into the prepared pan. Cover with plastic wrap and let rise. Preheat the oven to 350-degrees F. Remove the plastic wrap and bake for 35-40 minutes, covering with foil for the last 10 minutes. Remove to a cooling rack and let cool. Combine the icing ingredients and whisk until smooth. 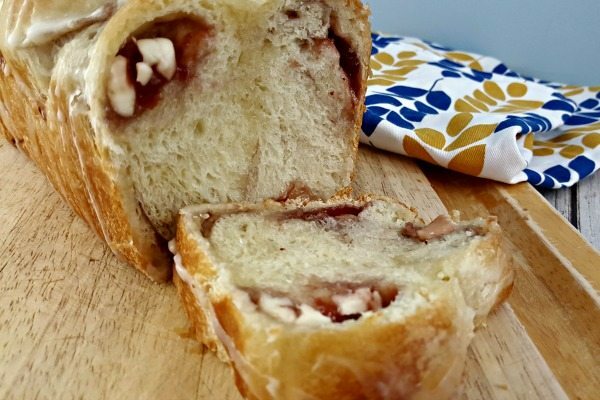 Drizzle over the cooler Strawberry Cream Cheese Loaf. Optional, before baking, sprinkle the dough with 2 tablespoons slivered almonds, if desired. Cutting slices of this is so fun for the kids to see where the pockets of filling are. It's beautiful and tasty! Add the zest of one lemon to the icing and omit the almond extract. Swap out the strawberry for another flavor like blueberry or raspberry. Omit the jam and include 1/4 teaspoon of brown sugar and a sprinkle of cinnamon in each dough ball. 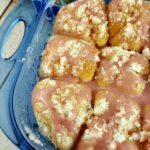 The icing is simple to make, and adds just the right amount of sweetness to this Strawberry Cream Cheese Pull Apart Bread. For a delicious brunch, have a variety of dishes to suit different tastes. This Sweet Potato and Bacon Hash from Garlic & Zest combines two great brunch elements in one dish. Simplify your brunch by making up a batch of Cheddar Apple Sausage Muffins with Cinnamon Honey Butter from A Mind Full Mom ahead of time. Modify this Breakfast Parfait from Bits of Wellness and make mini versions ahead of time or set out all the ingredients and let guest make their own.